As if pregnancy wasn’t tough enough with all its physical demands and hormonal changes, for some unlucky women there’s also the added stress of Bell’s palsy – a condition which causes facial paralysis and is more common in mums-to-be. Here’s what you need to know. Bell’s palsy is where the muscles on one side of your face become weak or paralysed. Named after Sir Charles Bell (a 19th Century surgeon from Scotland who identified the facial nerve and connection with the condition), the inner ear becomes inflamed which places pressure on the facial nerve resulting in paralysis. While no conclusive cause for the condition has been determined yet, links have been made with viruses such as influenza, herpes and chest infections; along with stress and low immunity. What does it have to do with pregnancy? The two peak age groups for Bell’s palsy are under 40 and over 60, with the younger group due to the high number of cases in pregnant women. In fact, women expecting babies are more at risk for Bell’s palsy than anyone else, with studies showing it occurs during the third trimester or within seven days of giving birth. Whether this is due to the stress that expecting a baby can bring or something physical, no one knows for sure. What is known, however, is that chronic high blood pressure and obesity are two other factors which increase the odds of Bell’s palsy. So if you have these, your risk for the condition will be higher. Additionally, the onset of symptoms occurs quickly, within hours. The good news is that in most cases, Bell’s palsy is treatable and it’s possible to make a full recovery, with recovery times varying from three weeks to six months. 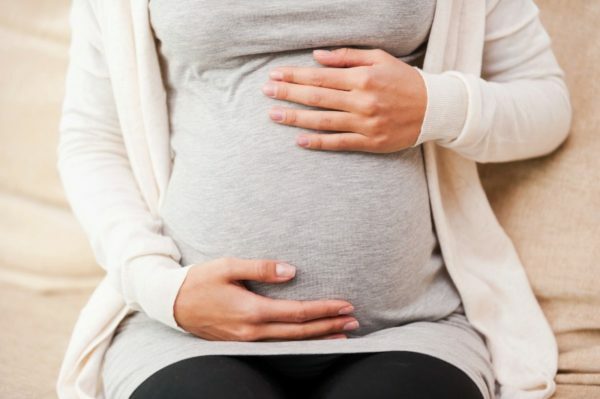 If you’re pregnant and suspect you might have the condition, the first thing to do is see a doctor immediately who will check that your facial paralysis is not something more serious such as a stroke or a tumour. If it is Bell’s palsy, then usually corticosteroids will be given which are proven to be quite effective in reversing the symptoms (corticosteroids are also commonly used to treat asthma and dermatological conditions in pregnant women). A doctor may also prescribe eye lubricants and ointments and advise you to tape your eye at night. If recovery isn’t complete, other options such as facial physiotherapy and botox might be explored. The main thing to remember is that it’s imperative to seek treatment for Bell’s palsy within the first 72 hours to ensure maximum chances of recovery. Developing Bell’s palsy while pregnant can be a very frightening time made even worse with potential anxiety over appearance and other ’embarrassing’ symptoms like drooling. Women can feel very vulnerable, and if they still have it once their baby is born, they may struggle with their inability to express emotions properly and might not want their photo taken. They, therefore, need all the physical and emotional support they can get from their partner, family and friends. If you’re pregnant and suffering from facial paralysis or suspect you might have Bell’s Palsy, please speak with a doctor immediately.